Editors Note: This site was formerly named Iconic or not . Welcome to Kyle Pierson.com, my updated site. I’m rebranding my old website under my name, and sharpening my focus to Florida modernist architecture, culture, and rising sea level. The state is famous for sandy beaches, colorful people, and Disney World. It’s the third most populous state in the nation. Most people live less than 25 feet above sea level. The geography attracts visionaries challenging us to reimagine the landscape. A hundred years ago, the new vision for architecture was Bauhaus, now labeled mid-century modernism, a type of architecture that’s made a comeback. In the 1950s, Sarasota was the epicenter for architects practicing and experimenting with new designs, materials, and philosophies. Welcome. I hope you’ll follow me. In 1938, Modernist Frank Lloyd Wright built Florida Southern College, “Child of the Sun,” highlighting the rolling hills of Lakeland. 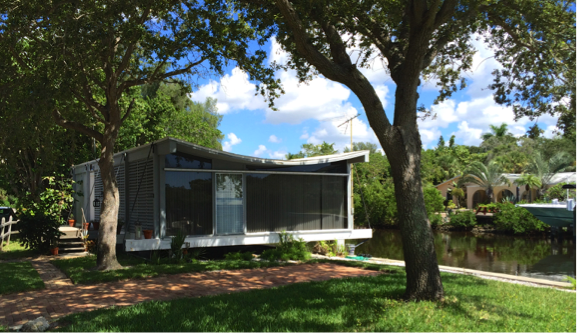 His work drew Paul Rudolph to Sarasota. Both were interested in creating site-specific Florida architecture. As a young man, Paul Rudolph was inspired by the lovely breezes flowing through vernacular houses in his native Alabama. Pre-A/C days, he envisioned cool Gulf air drifting through Sarasota’s sliding glass doors and jalousie windows. Rudolph inspired a whole generation of architects to design for the tropics. The Sarasota Architectural Foundation has preserved some of Rudolph’s houses and they educate visitors about the Sarasota School legacy. Florida is basically one long beach with some dunes in the middle; the highest elevation is in the panhandle. Despite what our governor says, we are experiencing the effects of global warming now; Miami is already elevating streets that are perpetually flooded, yet construction is booming on south Florida beaches. New buildings will have to withstand rising sea levels. 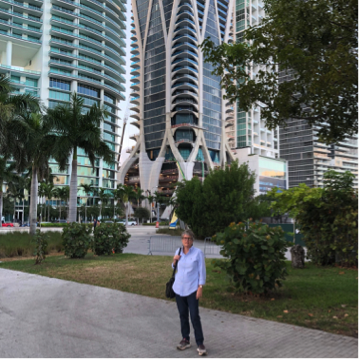 Pictured above is the newest addition to the Miami skyline, Zaha Hadid’s 1000 Museum. It is in the yellow zone, meaning that the parking garage is likely to flood with a 3 ft. sea level rise.